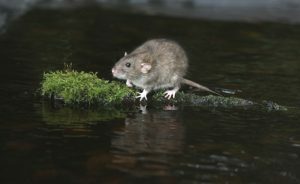 NJ nuisance wildlife removal is usually required when cooler weather arrives and the outdoor pests want to move indoors as your new domestic house guests so they can stay warm. Consider these tips to make your property resistant to wildlife intrusions. There are several tips to prevent wildlife from becoming unwanted guests. These include actions you can take both indoors and outdoors. Check vents leading to the attic and chimney tops to ensure they’re screened to keep wildlife out. Also, replace a torn window or door screen as these are another entryway. Trash left out in the open is a calling card for wildlife. Think camping and bears pillaging for food and that’s the same scenario you could have in your yard. Keep trash in secure bins. Tree limbs growing near the roofline are like providing an interstate highway with fast access for wildlife to find entry points. Store wood for the fireplace a minimum of 20-feet from your home. Also, don’t keep piles of debris piled up in the yard. Use secure bird feeders that allow access only to birds. For expert NJ nuisance wildlife removal, you need the services of a professional who knows how to remove squirrels, raccoons, opossums, and other critters safely. When wildlife comes knocking at your door, basement, or attic, call Stern for fast-action help. We handle NJ nuisance wildlife removal the best way possible; quickly. You Think You Have Squirrels in Your Attic, What Do You Do First? Make Sure Squirrels Don’t Bite You! Squirrels are opportunists when it comes to finding warm, dry, and cozy locations to make their nests. Even the smallest opening isn’t a problem for creative squirrels looking for accommodations inside your home. There are several ways squirrels can enter your home to set up housekeeping. One popular area is the attic. Another is crawl spaces, and a third is inside the soffits. – Do a visual inspection of the outside of your home searching for any holes, cracks, or crevices squirrels may enter. – Check for broken soffits. Squirrels are adept acrobats and squeezing into a soffit is easy. – If crawl spaces aren’t secure, meaning there’s no barrier to keep critters out, be creative with covering the hole that allows access to you but not to wildlife. 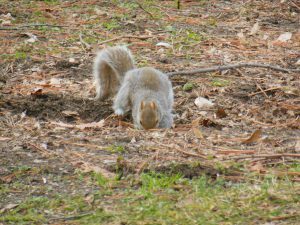 – An area that is already damaged is another easy entry point as the squirrels will chew their way inside. NJ squirrel removal is not something you want to handle on your own. While there are traps and baits available to capture and remove squirrels to another location, it’s best to let our experts at Stern Environmental Group handle the issue safely. Contact us today for an inspection. Our NJ squirrel removal goal is fast and efficient service, a focus on customer satisfaction, and a squirrel-free environment. What Diseases do Squirrels Carry? Squirrels are cute, furry and cuddly, but that doesn’t mean they can’t be a nuisance. They often find their way inside homes as the weather gets colder in the late fall and winter seasons. Not only can they cause problems in your home, but they can also carry diseases. 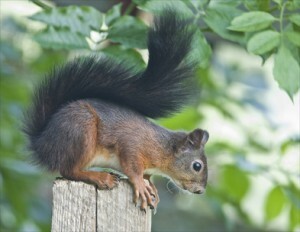 As your Long Island squirrel specialists, we want you to be aware of the dangers of these pests. Most people don’t realize how dangerous squirrels can be. You also may not know if a squirrel is carrying a disease until you get bit by one. It’s tempting to buy a squirrel trap and handle the situation yourself. However, this can also be dangerous. Squirrels can be quite vicious if they feel threatened. If one of them has a disease it can become even more aggressive and dangerous. It’s best to let Long Island squirrel specialists handle any squirrel problems in your home. At Stern, that’s just one of the services we provide to our customers. Having a squirrel in your house can be annoying at best, and quite often, it can also be hazardous. Contact us to get information on how we can help you. Wildlife are Cute, but Beware the Diseases they May Harbor. While wildlife may be cute, interesting, and fun to watch, NJ wildlife pest control specialists will tell you that it’s best to keep critters at a safe distance. Animals live in the wild, but unfortunately, their habitat areas are slowly being encroached upon by humans in their quest to construct new buildings. This pushes wildlife into human areas where they must compete for food, warmth, and safe nesting places to give birth and raise their young. In their desire for a new place to live, wildlife often finds ways into a home or business. Whether it’s in a crawl space, in the attic, a storage shed, or inside a porch, their presence can result in damage to the property as well as subjecting humans to pests, such as fleas, mites, and ticks, and a long list of diseases such as rabies, ringworm, encephalitis, toxoplasmosis, mumps, and more. The most common wildlife seen in communities include rats and mice, skunks, groundhogs, pigeons, opossums, raccoons, feral cats, and squirrels. While you may want to attempt to remove wildlife to another location on your own, it’s best to leave this part to the professionals. If unwanted wildlife shows up, contact our NJ wildlife pest control technicians as soon as possible. We have the experience and the proper methods to safely remove pests that have set up residence in your home or business. Squirrels Are Cute in Your Yard, But Not In Your Office! Persistent and acrobatic, squirrels might seem cute and fuzzy when they’re playing in your yard, but they’re anything but cute when camping out in your attic. Five-a.m. acorn-rolling contest anyone? What can be done about these playful nuisances? Squirrels can be aggressive, particularly when defending their young. They’ve been known to remove the tips of people’s fingers when their “territory” (your home) is challenged. Squirrels typically squeeze in at the roofline of your home to nest between the attic floor and ceiling. They can bring in fleas and ticks, yard debris, and worse yet – chew their way through vinyl siding, hardware cloth, chicken wire, beams, insulation, and eventually your electrical wires. The latter could lead to a fire. There are several different ways to remove these rascally rodents from your attic, including one-way door-type tubes with a flapper that allows exit but no re-entry, and single or multi-catch squirrel traps. 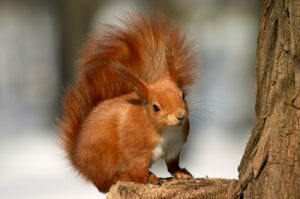 As it is illegal to release captured squirrels onto public or private land without a permit, the latter method typically involves euthanasia. After the animals have been moved out, however, the battle is not yet over. All potential entry points must be tightly sealed with not just plywood, but heavy-duty aluminum flashing or steel mesh. Let the NJ squirrel control experts at Stern Environmental help you show them the door. Contact us today.